After last years Queen Of The Witches album Crystal Viper are back with an EP, a treat for their die-hard fans! The EP is only available on vinyl and limited to 500 copies! You have to be quick to get hold of one of the clear vinyl EPs! With heavy riffs they kick off and then storm off into an 80's heavy metal tune, but as usual their songs sound fresh at the same time. Marta Gabriel is adding powerful vocals to At The Edge Of Time, the title track. After staccato riffing they slow down and add a mid-paced folk-tinged part before heading into a guitar passage with neo-classical elements. They additionally recorded the title track in their mother tongue - Zwiastun Burzy. Personally I like to listen to songs recorded in the language of the artist, and in my opinion this version sound very good. In my opinion Slavic languages work well with heavy metal. The fan favourite When The Sun Goes Down they present in a different version, the Giallo version. Not much changes... It's still a mid-paced rocker with an epic edge. But at the opening passage they added some organ and so give it a different feel. And it's slightly longer than the original. A new track is the piano-based ballad When Are You. This song shows a different aspect of Crystal Viper and is enchanting in it's simplicity. The closer is a cover version of NWoBHM band Quartz, Tell Me Why. I like the version of Crystal Viper, it sounds modern. But somehow I miss the charm of the original... I guess, it depends on my mood which version I prefer. Anyway, it's fun and if you don't know the original, you wouldn't guess this is a cover! Crystal Viper made it sound like one of their own! Well done! I can just recommend this to all fans of Crystal Viper! 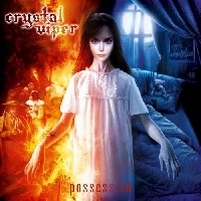 Crystal Viper and Marta Gabriel are around for quite awhile, they release albums frequently and their new output is called Possession. The songs are about demonic possession. The intro is called Zeta Reticuli and leads over to Voices In My Head. The track has an 80's heavy metal edge and Marta's powerful vocals remind me a bit of Acid and Rock Goddess. Only the King Diamond-like screams don't work out perfectly. Julia Is Possessed has fast parts and hymnic passages. 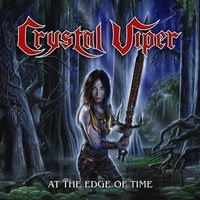 Crystal Viper show that they know well when it's time to ease off and add another sound element to stay away from boredom. Fight Evil With Evil sticks out due to guest vocalist Harry Conklin who joins Marta on this one. And I think it also speaks for the quality of the album, coz Harry Conklin is choosing well his participation. Why Can't You Listen? is representing the epic side of Crystal Viper while You Will Die You Will Burn is a straight rocker with fast parts. The tune slightly reminds me of some old Warlock tune... Prophet Of The End is a powerful slow one, once again the guitar play of Marta Gabriel and Andy Wave is ennobling the tune. This one is the closer, but the CD has a bonus track, a cover version of Riot's Thundersteel! And they do very well. Possession is less epic, but it might came with the concept... Crystal Viper are stick to their guns, only the focus shifted a bit. Well done. From Poland comes Marta Gabriel and her band Crystal Viper, a female bandleader who vibrates with professionalism and makes one great album after another. The latest album, Crimen Excepta, is focused on witches and horror, but Marta Gabriel sings in her usual sharp and powerful way, like a mix of King Diamond and Lee Aaron, and the music hits you like a hammer in the face. It's Your Omen use keyboards to get more melodic influences to the song, but the theme is witchery and damnation that brings the song to make the path clear for Crystal Viper. Crimen Excepta is the title song, featuring David Bower (Hell) on the vocals, but it is so hard driven and technical that you wonder why Crystal Viper haven't turned to this style before.... Medicus Animarum is more of the tough vocals, great power metal in the style that Judas Priest made in the 70's and 80's. Hope Is Gone, Here Is New Law grabs the listener by the throat with a melodic song in a way Doro could have done it, with strength and fine guitar work. Fire Be My Gates is gothic metal but still in the hard powerful way that is ever present on the Crimen Excepta album. Tyrani Piekiel is the cover version of the song Vader trashed the crowd with, Vader's frontman Peter Wiwczarek is featuring on vocals on the speed tempo and well balanced version that finds it's place on Crystal Viper's album. As the last song we get a track to be featured in the 3D movie Ghost Of Sherwood, a soft gothic spellbinding tale filled with power and gothic metal hand in hand, and it makes a perfect finish to this fantastic album. The song Ghost Of Sherwood may be a little odd, but it fits the atmosphere on the album by lengths. 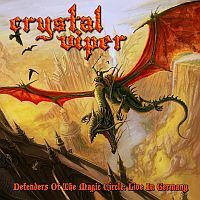 Crystal Viper is a Polish band that exudes boundless enthusiasm and energy on each and every release. When the band signed to AFM they released the live album Defenders Of The Magic Circle (I think I'm one of the few people who loved this release! ), which included the song Secret Of The Black Water as a taster for the upcoming third album. This was like giving a man dying of thirst a single drop of water! Well, never fear because now the floodgates have opened in full and the album is here! This third album from the incredibly fun Polish bunch is all about the old legends of their homeland. 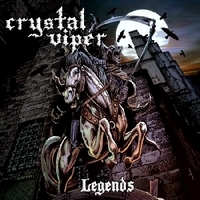 Those who have heard anything by Crystal Viper before will know exactly what to expect from Legends. For those who haven't heard them it is very apparent that Crystal Viper are heavily inspired by all the classic eighties 'true metal' bands – Manowar, Judas Priest, Iron Maiden, Accept, Agent Steel etc – and each and every one of these influences can be heard on Legends. Kicking off with a short spoken intro Crystal Viper launch the full metal assault with The Ghost Ship, a true metal killer in classic style! Catchy hooks, galloping basslines and Marta Gabriel's fantastically passionate vocals will draw you in and won't let you go 'til you're suffering chronic whiplash! The chorus will stick in your mind for ages after you hear this track. If there's one thing you know immediately its that Crystal Viper are on top form! Blood Of The Heroes, which features Primal Fear's Mat Sinner, and Greed Is Blind, for which the band made a video (which you can watch at http://www.youtube.com/crystalviperofficial), show different sides of Crystal Viper's repertoire with different tempos and so on but they are both still rousing true metal anthems. Sydonia Bork is a piano-led power ballad that allows Marta Gabriel the opportunity to show off just how passionately she can sing... and what a job she does! I'm not always a big fan of ballads on metal albums as too often they ruin the flow of the album or are just utter crap. Crystal Viper never let me down though and I actually think that throughout their discography the ballads have been amongst the strongest songs the band have created. After this ballad the band reverts back to making your head bang as much as possible! Goddess Of Death is a real Crystal Viper signature track with a bouncy mid-paced beat and catchy sing-along chorus. Night Of The Sin contains one of my favorite solos in the whole album and Secrets Of The Black Water stands out as one of the best tracks on the album! The band speeds through A Man Of Stone and Black Leviathan, which starts in a very Iron Maiden-style fashion,  before finishing with a great cover of Accept's TV War. What an album! This beats the debut and sophomore albums for sheer enjoyment. There is not a bad song on it. I expected Crystal Viper to deliver another good helping of classic metal but this far exceeds what I hoped for! If you want to have a good time and rock out then Crystal Viper are the band you should be listening to. The fun, exuberant attitude of the band and of Marta in particular is infectious and I guarantee you'll be smiling as your head falls off from excess headbanging when you listen to this album! I can't begin to tell you how much I've been looking forward to this album. I've adored Crystal Viper since I first heard them. The Polish quartet, fronted by the amazing Marta Gabriel, have released two storming albums which are a perfect fusion of old school, balls-out attitude and modern power metal sound. They have a new deal with AFM Records under their belt and with a third studio album being recorded what better way to fill the gap than with a live album? Breaking The Curse is the first track and this launches into the rallying call of the second album's title track Metal Nation, undoubtedly Crystal Viper's trademark song so far. The first thing you notice is just how clear and strong Marta Gabriel's voice is. She sounds amazing and I would even venture to say she sounds better on this live recording than she did on the studio albums! This is consistent throughout the live songs and shows just how powerful a voice this metal lady has! The next track is Legions Of Truth. Not one of my favorite Crystal Viper songs but the performance is spot on; the band sounds really tight with great sound! Even the high-pitched vocal section is sung with seemingly no effort! Marta appears to have been in high spirits at this show as she greets the crowd and introduces a 'song about pirates'; Island Of The Silver Skull! Undoubtedly this was one of the highlights from the incredibly strong first album and it sound absolutely spot on here. A live version of this track was included on The Last Axeman EP but this version is so much better, the recording crystal clear. Shadows On The Horizon is next up and Marta informs the crowd that they'll be singing along to this one! Close to the end of the song the crowd is drawn in. Bassist Tom Woryna and Drummer Golem keep the beat up nicely whilst the crowd sings along with Marta. The one downfall here is that the crowd sounds quite sparse and its a little underwhelming. This songs deserve to be heard by crowds of thousands, a legion of metal voices screaming Crystal Viper's metal anthems at the top of their lungs! Still, this is not a fault of the band and you can always add your own voice  as you sing along to the CD! That the crowd enjoyed the set is not in doubt as you can hear them singing along and they seem genuinely sad when Marta announces the last song; The Last Axeman. By this song I just wanted the live tracks to continue, as I'm sure the German crowd did. The sign of a good live album is when it makes you think 'I wish I was at that concert right now' and this small selection of songs certainly does that! Alas, this truly is the last live track on the album which is a real shame. Fortunately, we can't be too heartbroken as four studio tracks follow! Of the remaining four tracks the first is a taster from the forthcoming album. Entitled Secret Of The Black Water, this song is a mid-paced headbanger with a strong bassline and catchy chorus. In other words its perfect Crystal Viper! Marta's voice sounds brilliant again and if this doesn't whet your appetite for the new album, nothing will. Next up is The Wolf And The Witch, a quality rocker previously only available on the vinyl single of the same name. So glad its finally on CD as its a great track and now I've finally heard it its probably going to be one of my faves! Stronghold is another song that was previously released in limited numbers as an accompaniment to the tabletop wargame of the same name. Its another really strong Crystal Viper track that deserves to be heard by a wider audience. Obsession (It Burns For You) is the final track on this CD and is a cover of the Virgin Steele song. I'm unfamiliar with the original, so I can't compare them but its a good track that I really enjoyed. I would hope that fans of the original will give this version a shot as Crystal Viper's past record with cover songs has been very good! I don't think Crystal Viper have ever sounded as good as they do on this EP and I simply cannot wait for the new album and hopefully a big tour! Of course, this EP has its downsides too. I would hesitate to call this a complete live album. There are only six live songs, the remainder being studio recordings so this is more of an EP which shows the force of Crystal Viper in a live environment. The good news is that the live songs are better than the six that were showcased on the The Last Axeman EP. The sound quality is so much clearer. From a personal point of view I would preferred a full live album but I'm sure this will be done in the future as Crystal Viper will continue to gain more fans and do longer shows. However, as it stands this is an excellent release by a band that is becoming known for quality and excellence. This will be getting many, many more spins before the new album arrives and many more after! 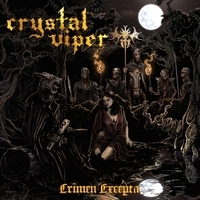 Crystal Viper is a four-piece female-fronted band from Poland, headed by singer Marta Gabriel. Don't worry, this isn't yet another symphonic band with a love-em-or-hate-em operatic singer, but a real power metal band with a rock singer a-la Doro Pesch or Elisa C. Martin. This Polish quintet take the tried and tested, sword-waving, old school formula of Manowar and couple it with the boundless enthusiasm and Euro-power metal sound of Hammerfall. 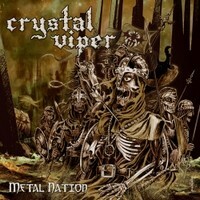 Metal Nation is Crystal Viper's second full-length release and includes ten songs (eleven on the Japanese version). Most of the songs on the album are pure, fist-pumping, headbanging, balls-out metal of the highest order, from the anthemic Metal Nation to the Agent Steel cover Agents Of Steel. The exceptions are the pleasant keyboard intro Breaking The Curse and the rousing but melancholy ballad Her Crimson Tears, which includes one of Marta Gabriel's best and most endearing performances on the album. This is a short respite in an otherwise fast-paced album. Some of the songs aren't quite as enjoyable and memorable as others, such as 1428 and Zombie Lust (Flesh Eaters), but they're still enjoyable enough that you won't find yourself reaching for the skip button any time soon! Towards the end of the album is the epic Gladiator, Die By The Blade. This was the first Crystal Viper song I ever heard and still one of my favorites. I still say that if this was included on the Gladiator film soundtrack it would have been even better! Of course I jest but it is still a truly amazing song, easily the best song about gladiatorial combat since Bal-Sagoth's Blood Slakes The Sand At The Circus Maximus for making you feel a part of the action. If there is any criticism I have to level at this band it is to do with the lyrics. Unfortunately it seems like a lot of the lyrics are direct translations from Polish, rather than translations for meaning. This leads to a lot of the songs actually making little sense at times in the lyrical department. To be quite frank though, this is a small criticism. You can still sing along to the choruses while waving your fist in the air and at the end of the day that's all you need to care about with this form of music! No, not much of it is original but it IS power metal. Anyone looking for innovation in this genre really needs a reality check! The best you can hope for is to have quality songs played well and that is exactly what Crystal Viper deliver with aplomb! I'm no musician, but I didn't notice anything at all wrong with the skill level of the four members involved in this band. Marta Gabriel's vocals vary from quite raw grittiness to soaring heights and hell, she can wail too! She does have quite a thick accent at times which is typical of a lot of continental vocalists, but in spite of, or maybe because of this she has one of the best voices I've heard in along time. As if that wasn't enough there are also guest appearances from Manni Schmidt of Grave Digger, Lars Ramcke of Stormwarrior and Frank Knight of X-Wild! Does this sophomore effort stand up to the amazing first offering (The Curse of Crystal Viper, 2007)? Probably not quite. Its still great with some phenomenal tracks and boundless energy, but the  first album just tips it. The title song says "We are Metal Nation!" and this is not only a rallying cry for metalheads everywhere to unite but also a definite statement of intent from this hugely talented and enjoyable band! Listen, enjoy and join the growing legions of Crystal Viper!